Palomino RV launches the HS-750, an all-new 8-foot hard-side, non-slide, wet bath truck camper. With a roll-over sofa, exterior battery tray, and tankless water heater, the 2019 Palomino HS-750 has some interesting tricks up its sleeve. It’s been about two years since Palomino RV has debuted a new truck camper model. This is unusual for a company that regularly debuted new models every fall for the industry-only Elkhart Open House and now defunct Louisville trade show. So what’s been going on at Palomino? Where are the new camper models? In short, demand for the their existing pop-up and hard side truck camper products has been nothing less than record-breaking. To keep up, its been all hands on deck for the Palomino RV management and production teams to increase capacity while maintaining quality control. By necessity, new camper development has taken a back burner. This is exactly what we have been hearing from nearly the entire truck camper marketplace for some time. Demand has been at or near all-time highs. Keeping materials and components in stock and finding enough quality hires to keep up has been an all-consuming task. As the saying goes, make hay while the sun shines. Angela was very excited to spot a new Palomino model at the Elkhart Open House this past September. The funny thing is that they forgot to tell us this was in the works. Ben Meloche, General Manager for Palomino RV has been working at the Colon, Michigan manufacturer for about 12 years. At the Elkhart Open House, I’m in shooting mode. New camper? Shoot it! New feature? Shoot it! Got news about truck campers? Well, shoot! Thankfully, Angela is more nuanced in these situations. As I fired away at the HS-750, she scheduled an interview with Ben and gathered important details on their new unit. To get the back story on the HS-750, we talked to Ben Meloche, General Manager for Palomino RV. The 2019 Palomino HS-750 is a hard-side, non-slide, wet bath truck camper for short or long bed trucks. The interior floor length of the Palomino HS-750 is 8’2” and the interior height is 6’6”. Palomino RV is reporting the standard build dry weight of the HS-750 at 1,860 pounds, which includes electric jacks. 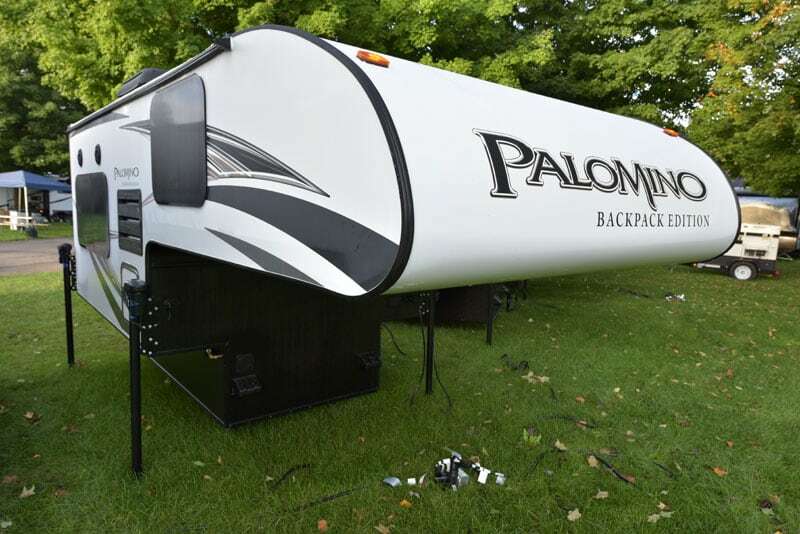 The 2019 Palomino HS-750 has a 31 gallon fresh tank, an on demand water heater, 8 gallon grey tank, and 8 gallon black tank. The camper accommodates one battery and one vertical twenty-pound propane tank. The MSRP for a standard build 2019 Palomino HS-750 is $21,500. In the fall of 2016, Palomino debuted the HS-650, SS-500, and HS-2901. In the two years since those new truck camper announcements, Palomino has not launched a new truck camper model – until now. What’s been going on with truck campers at Palomino for the past two years? Dealers and customers have been asking for new floor plans, but we haven’t had the time. We have been knee deep building units to meet demand. Unfortunately, designing and building prototypes of new floor plans takes away from production. To better meet dealer and customer orders, we moved truck campers to a much larger production facility here at Palomino RV. We have three production plants here. Truck campers are now in one of our two larger plants.